In 1884, after artist-poet-designer-printer William Morris compulsively read his copy of the first edition in French (1872-1875) of Karl Marx's Das Kapital until its flimsy binding was a wreck, he asked the great T.J. Cobden-Sanderson, then new to the craft of bookbinding but with enormous promise and taste, to rebind the book's first volume before it completely fell apart within his enthusiastic hands. Morris, who had joined the new Social Democratic Federation, Britian's first fan club for Marx, shortly before wading into Das Kaptial waist-deep, was besotted with the German philosopher. He "was full of Karl Marx whom he had begun to read in translation" according to an April 13, 1883 entry in his friend Cormell Price's diary. Morris loved Marx's take on history but Marx's economics were another matter: Morris admitted that they caused him "agonies of confusion of the brain." Despite the headaches, on March 14, 1883 Morris participated in a march to Highgate Cemetery where pilgrims congregated at Marx's grave to celebrate the anniversary of his death. 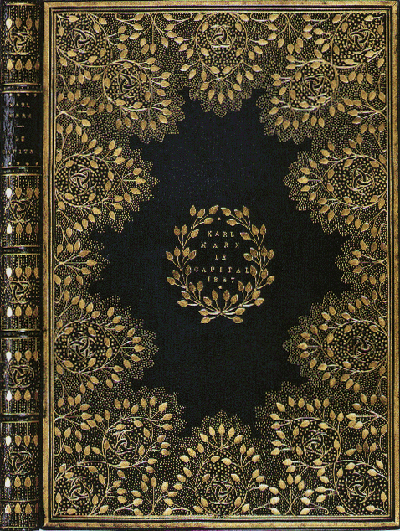 This was the second binding by Cobden-Sanderson in his own workshop, the Doves Bindery (he had previously apprenticed with Roger de Coverly), a remarkable achievement for someone new to the art and craft. "This book - Le Capital - was bound and tooled for William Morris by me in my first workshop on Maiden Lane 1884 and finished the 9th. October and the pattern on its sides and back is the second of my making. The tools were second hand and bought - and used - at haphazard, but the tooling and the binding pleased William Morris and his pleasure was my own great delight. In Memoriam I write this the 24th. February 1897. T.J. Cobden-Sanderson. I should like to add the book was his own & before it came to me to be bound had been worn to loose sections by his own constant study of it. T.J.C-S."
It is unknown what formal arrangements were made between Morris and Cobden-Sanderson beyond the presumed from each according to his abilities to each according to his needs. I suspect, however, that Lenin would have proclaimed this binding of Das Kapital an example of excess completely out of touch with simple, proletarian utility. The fact that it wound up in the collection of Estelle Doheny, heiress to her husband Edward's vast oil fortune, would have surely thrown him into a fit. Karl Marx finely dressed and living with a capitalist fat cat? Nyet! MARX, Karl. Le Capital. Traduction de M.J. Roy, entièrement révisée par l'auteur. Paris: Maurice Lachatre et Cie, [1872-1875]. Tidcombe, Cobden-Sanderson no. 2. Wormsley Library 81.